Women go through phases. Or deal with wild, fluctuating moods. Or return to a long lost hobby. But someone once said that people who enjoy eating always go back to their love for cooking – despite vows to stay away from the kitchen. They feel a rekindling of sorts, eager once again to fiddle about with the soiled pages of favorite cookbooks, hear the clanging of pots and pans and to feel the vibrating electric mixer as it produces a soft but determined buzzing. In my case, it wasn’t a rekindling, or a rebirth, or a going back to basics type of situation. The love for cooking happened accidentally. What I mean is, the desire to learn cooking was born, ignited – like a novelty taking a hold of me. My father died last year. I spent two and a half months with him, ate with him and looked after him when I wasn’t banging away on my computer. When I returned to Montreal, I suddenly decided that cooking was going to be part of my life from now on. It was my way of keeping his memory alive. It was only logical: dad loved to eat, he adored my mom’s cooking and both of them ate heartily, never mind the cholesterol warnings. Eating was pleasurable. Period. The meals I shared with my father in his last days struck a chord that reverberated in my psyche. Back in Montreal, I was nostalgic and longed to be breaking bread with him again, sitting together in that unstable, round dining table with the squeaky lazy Susan that I’ve learned to love. When my father knew he was going to die, he kept to himself – uncommunicative, withdrawn. But his love for eating never left him. He looked forward to breakfast, lunch and dinner, looking at his watch frequently because he knew that by 11 am, our helper would be announcing that lunch was ready, or that by 6:00 pm, we’d be called to dinner. Our three meals a day went like clockwork. And despite his frail health and diminishing appetite, dad always showed up or made an effort to be at the dinner table even as he became weaker and weaker. To him, if life couldn’t go on, the ritual of eating must. That I should have cooked for him when he was alive is a feeling that aches and nags at me. I knew that he was disappointed that I didn’t learn to cook like my mother. If he were alive today, he’d be in for a pleasant surprise. The dish above was one of my father’s favorites. These are beef strips marinated overnight in soy sauce and lots of lemon. Some cooks back home drizzle 7-Up into the marinade; it’s supposed to tenderize the beef. Next day, the beef strips are taken out of the fridge and left at room temperature for an hour. Then they’re fried to a crisp with fresh garlic and then set aside. The soy sauce mixture is poured into the same pan and is allowed to boil. 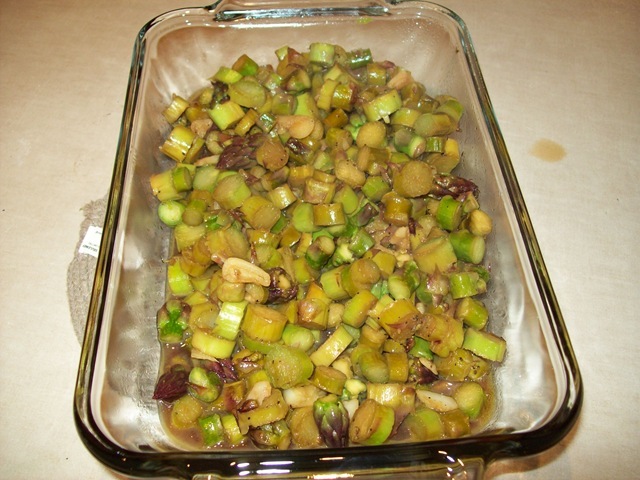 The temperature is lowered and the onions rings are sauteed until they’re no longer hard but still crunchy. 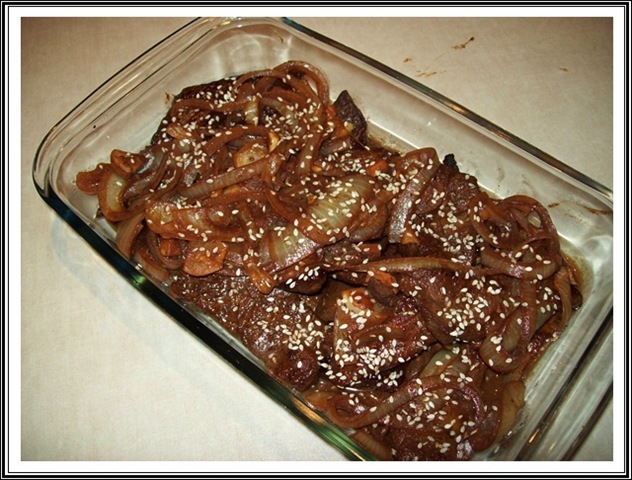 They’re sprinkled -along with the soy sauce mixture – over the beef strips. Sesame seeds are generously added right before serving. The soy sauce and lemon combination produces a sharp, tangy taste; it also gives beef strips an intense and tasty flavor! Wonder what dad would say he if tasted it? I’m referring to two different roots – they’re both yellowish/beige outside and white inside. If you’re a little tired of greens, these roots would make a happy salad alternative. The first one is jicama root – taken from a native vine originally found in Mexico. 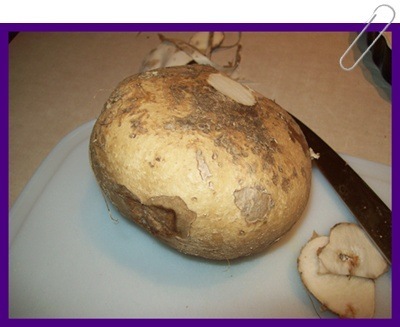 The popularity of the jicama root spread to Asia and most Asians have wholeheartedly adopted it as part of their diet. They make it as a side dish or mix it in with other ingredients in meals that call for some crunch, crunch! Jicamas are usually not sold in supermarkets, but a few ethnic stores sell them, especially during the summer (I notice they don’t last too long in the winter). 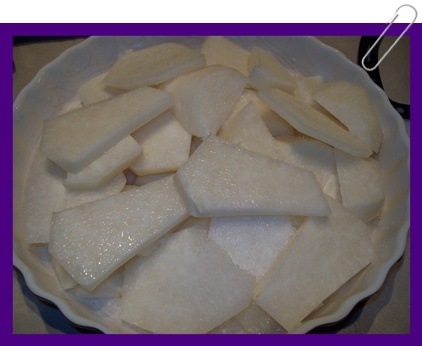 In Vietnam, jicama is called cây củ đậu or củ sắn or sắn nước; in China it’s called bang kuan or dòushǔ and in the Philippines, we call it singkamas. In Bengali , it’s known as Shankhalu. (thank you, Wikipedia!). It has a rough outer covering. Make sure the skin does not have too many "pockmarks." I can tell I’ve stumbled on a fresh jicama when I cut off the crowns at both ends and can easily peel it with my hands. It’s not always this easy to peel, however, but that doesn’t mean it isn’t fresh. If there are soft and deep brown holes or too much scarring inside, throw it out. You might see some tiny brown spots on the surface but these are nothing to worry about. You simply cut them off with your knife (as you would when peeling and slicing potatoes). The second is a root many of you may be familiar with. 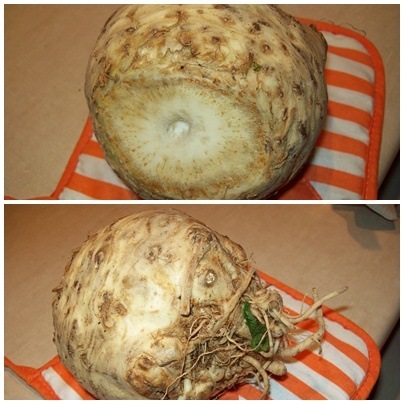 Here in Montreal, we call it "celeri rav" which is how the Francophones call it, and "celery root" as the English call it. It’s available all year round and most supermarkets have them in stock more often than not. There are times – rarely though – where you can’t find them anywhere. Again, you can slice celery root any way you want and combine it with grated carrots or beets doused with olive oil or with your favorite vinaigrette. After peeling, I slice them up in bite size pieces and run them through my Cuisinart shredder/grater/slicer. I use the shredding drum and they come out in half julienne strips (I say half because my machine can’t really produce whole julienne strips). I squeeze lemon (about 1-1/2 to 2 tablespoons) to prevent them from turning brown and then coat them well in mayonnaise and a knob of mustard (you can use any kind of mustard – do be careful with the quantity if you’re using a strong mustard). Add salt and pepper and you’re done! Remember your roots. They do make great salads or side dishes. Jicama salad is especially welcome when you have a heavy meal like steak and fries or a dish with a rich, creamy sauce. The celery root salad goes great with light chicken and rosemary, fish (baked or fried) and maybe a meatloaf or…buckets of fried chicken! 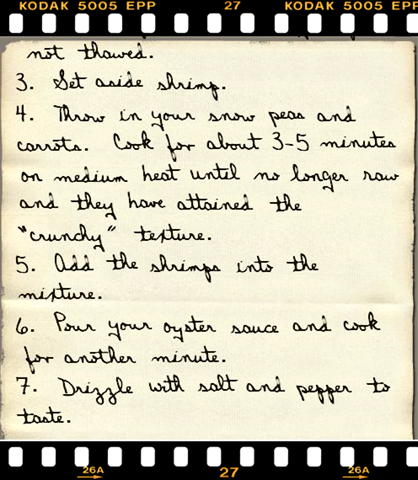 Back in May, I posted a shrimp recipe with green beans. 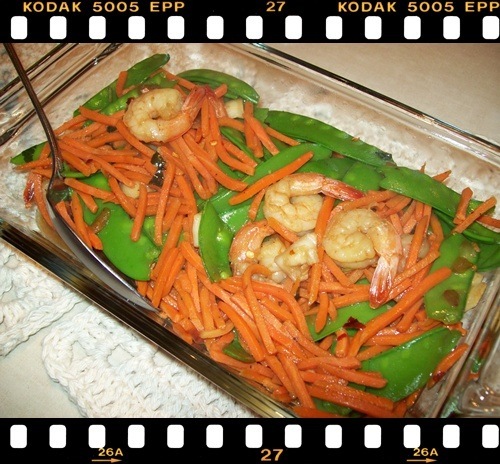 Here’s the link: https://sotsil.wordpress.com/2009/05/15/simple-shrimp-and-green-beans-recipe/. 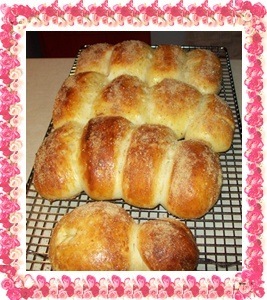 The picture on the left is a variation of that recipe. This time instead of green beans, I used snow peas and carrots. Back when I was all skin and bones and my poor mother was at her wits’ end trying to fatten me up, the doctor said I had an allergy to shrimps. Fortunately, that allergy didn’t last too long and I started eating shrimps and loving them. They may be high in cholesterol but my mother could not have cared one bit because she thought of me as a malnourished-looking waif; she didn’t want neighbors and friends to think that she was to blame for my impoverished look. She encouraged my love for shrimps and cooked meals which I devoured. I was particularly crazy about her camaron rebosado (deep-fried shrimp in batter – similar to the Japanese tempura). 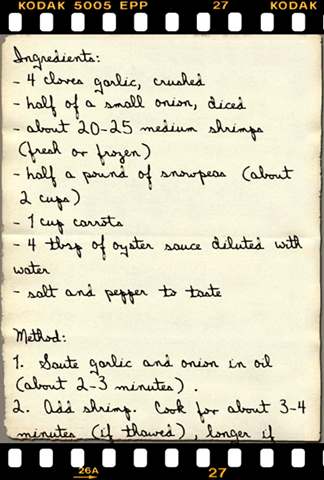 The fact that my father also loved shrimp made it a household staple. During those days, we were more concerned about good quality shrimps and where to buy them than about the cholesterol issue. I keep a bag of frozen shrimps available at all times because they’re one of the easiest to improvise a meal with. Foodies will say there’s a world of difference between fresh and frozen, but I don’t mind that difference one bit because there will always be ingredients that can enhance the taste of frozen shrimp. With a bit of creativity, imagination and enthusiasm, you can really whip up a dream meal. What I like about this recipe is the cracker-barrel crunch offered by the snow peas and the carrots. The trick is not to overcook them so they get just the right crunchiness. And it’s a meal that needs no salad as a side dish because you’ve got your vegetables already. As a matter of interest, shrimp contains many vitamins and minerals, notably niacin, vitamins B-12 and D, iron, potassium, sodium, phosphorous, and others; it is also high in protein. For every 100 grams of shrimp, you get the equivalent of 444 kj of energy! Let me clarify. This qualifies as a budget meal because you can buy fresh asparagus on sale at 99 cents a bunch and you need only a few ingredients: soy sauce, vinegar, garlic, oil, salt and pepper. Even if asparagus is selling at $3.00 a bunch, you get to spend only $6.00. Make that $10.00 if you have to buy a small bottle of soy sauce, vinegar and some garlic. 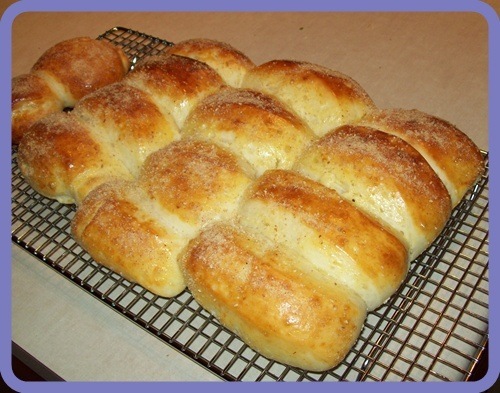 I got this recipe from www.kusinanimanang.blogspot.com. It’s owned by a lovely Filipina – Lori – who resides in rural Maine with her hubby and kids. Her blog has grown with an impressive following – mostly overseas Filipinos who yearn for foods back home and who want to learn the more intricate recipes like ensaymada (a sweet brioche) or lumpiang sariwa (fresh egg roll). I have visited many web sites run by Pinoys (slang for Filipinos) but I think Lori’s is by far the best one. There are hundreds of recipes in there and she writes with such an engaging style that it’s easy to get hooked. She’s a “go-to” resource when I need to learn how to cook something – whether native or international dishes. I’ve learned a lot from her, so when someone asks me to recommend a Filipino recipe web site, hers would be my # 1 recommendation. Now about adobo: my ignorance soon vanished when I did a bit of research. I thought adobo was strictly a Filipino invention – a vinegar, soy sauce and garlic concoction. It isn’t. Adobo is the seasoning or marinade used in Spain and other Latin American countries and is closely associated with chipotles and other peppers. Like Pinoys, they use it to marinate chicken, pork and beef – and sometimes vegetables. I’ve seen some Adobo products in the spice racks of Oriental stores so if you don’t have time to do this seasoning from scratch, you can use the powder form. If you can take a strong marinade like adobo and the combination of vinegar and soy sauce does not bother you one tiny bit, you’ll enjoy this recipe. It’s so simple and unpretentious and packs a lot of taste, despite the few ingredients. Use fresh asparagus, though. 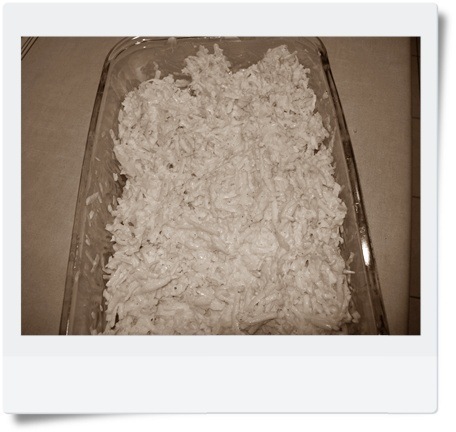 Hop over to Lori’s blog and look at the left hand column – you’ll see “asparagus”. Click on that. After your first visit, I think you’ll get hooked. I’ve made this dish three times now. There are never any leftovers. The adobo marinade can be used for other vegetables as well – broccoli or Chinese bok choy would be excellent candidates.